During Blizzard 2018 keynote a new Overwatch hero was revealed. The leader of the Deadlock Gang that Solider 76 keeps talking about, Ashe, has been confirmed for Overwatch. 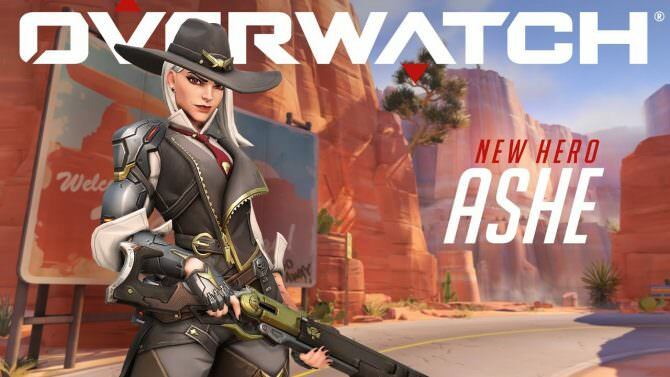 Ashe sports a similar Western attire as McCree and uses a lever-action rifle with a holographic sight. She can use a shotgun for close range or propel herself into the air. She can throw dynamite that can be shot in mid-air that causes an AOE fire effect. Lastly, Ashe's ultimate summons fellow Bob, a fellow gang member who deals damage to all enemies. Overwatch is now available for PC, Xbox One, and PS4.